A stranger to none is the liveried Sikh Doormen and the Raffles Ivory frontage. A stranger to none is the liveried Sikh Doormen and the Raffles ivory facade. 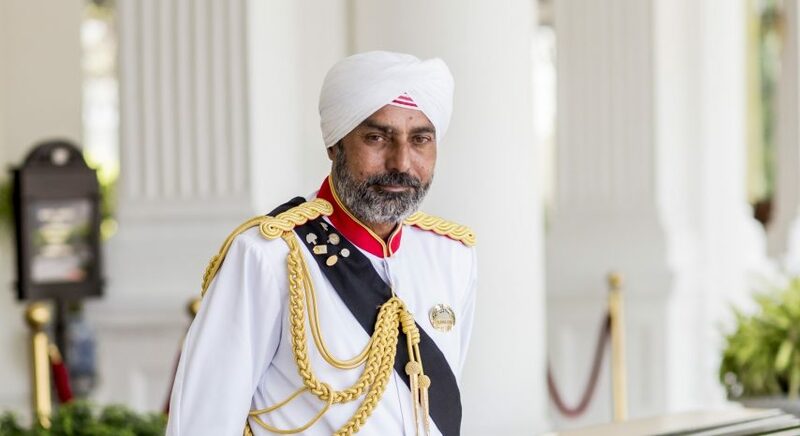 Being ambassadors of Raffles Hotel Singapore, our Raffles Doormen, recognised by their immaculate white turbans, are our most notable and most photographed colleagues. They are always the first to welcome all our guests into the hotel, including heads of states, dignitaries and celebrities and have also travelled around the world to receive countless awards on behalf of the hotel. Besides welcoming the guests, our doormen also pay attention to some rather “interesting” characters who have also crossed our doors. In 1904, a wild boar was on the way to the market and escaped into the hotel. Our doorman was in hot pursuit of the wild boar and wrestled with it on the ground. However, do you know which movie one of the Raffles doormen make a cameo appearance in? Watch the video to find out!